This rather attractive building stands at 198 Vernon Street on the junction with Austin Street in Over Stoke. To the left of the image in the rear of Vernon Street Co-operative store: the first such shop to open in Ipswich. Although it is clear that somebody has roughly filled the characters and the whole painted over in the dominant yellow. "The Orwell Mariner name came about in the 1980s, when Ipswich Borough Council threatened to close the pub down because of its "racist" name; a "fact" strangely lost on the pub's black clientèle (of whom there were many). Evidently the (no doubt white) person who made the ruling had never read Harriet Beecher Stowe's anti-slavery classic." 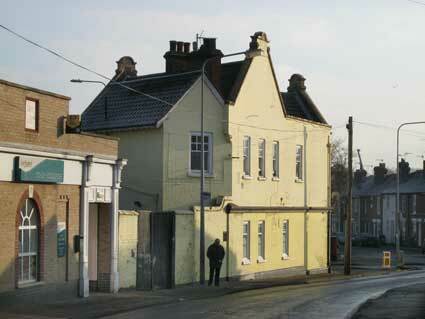 Originally only licensed as a beerhouse, according to the Ipswich licensing records the pub got its full licence on Februay 29 1960. The earliest licencee is listed as George Hartridge in 1871.
with each word separated by a 'decimal point'. The lower wording is decorative with curving, elongated serifs on the 'C', 'L', 'E' and a real whiplash on the lower curve of the 'S'. They sit between art nouveau scrolling and all looks as if it was intended to be gold against a black backgound panel, but the colour contrast is not that great now. 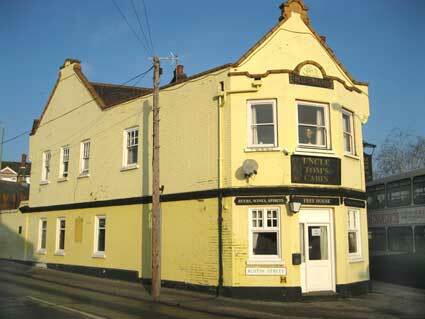 We think that the logo is that of Steward & Patteson Ltd, Pockthorpe Brewery, Barrack Street, Norwich. This company dates back to the 1790s and in 1963 was taken over by Watneys and eventually ceased brewing in January 1970. 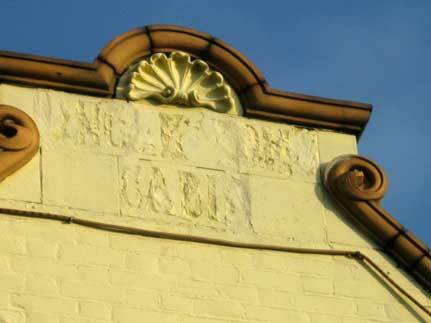 They seem to have had a variety of logos, some of which can still be found on old public houses. Our example is particularly fine: exuberant interlaced characters with curling serifs. 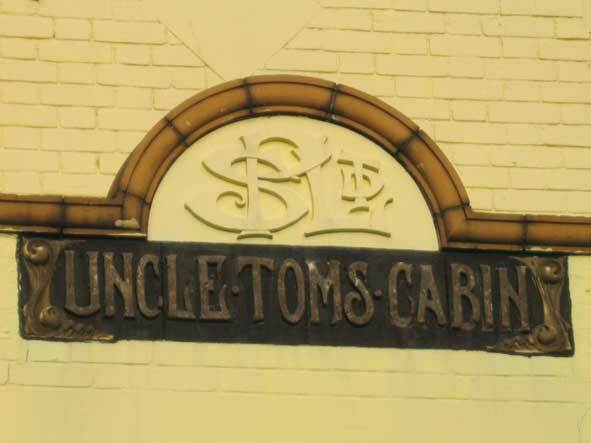 Uncle Tom's Cabin, which appears to have closed in May 2012, also has frosted windows which appear to be original. 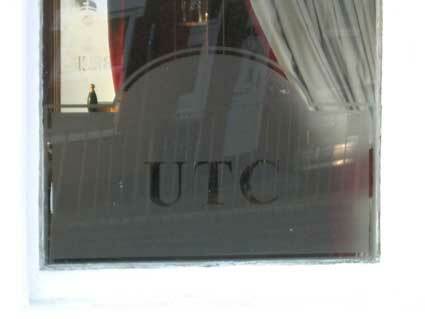 On the Austin Street side are: 'WINES', 'SPIRITS' and on each successive window at the front, including the glazed door: 'U', 'T' and 'C' (for the pub's initials). On the Vernon Street windows (shown above) are 'BEERS' and a repeat of the initials in one window: 'UTC'. It's only a few hundred yards from the here to Christ's Hospital Buildings, The Methodist Mission Room, The Old Bell and the Trinity House buoy and the Bake Office (towards the town) and C.J. Hawes shop (towards Wherstead). 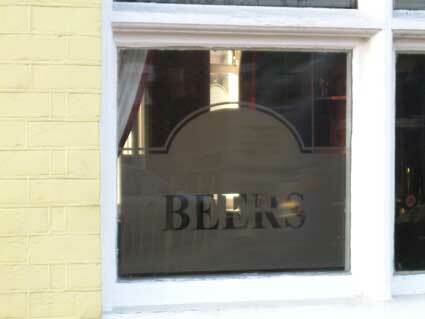 See our Pubs & Off licences page for more examples. Please email any comments and contributions by clicking here.